Headlined by RJ Jacinto, Pepe Smith and Ely Buendia, “Icons of Pinoy Rock" seeks to bring a historic gathering of Pinoy Rock Icons together to benefit and launch the Pinoy Rock n’ Roll Hall of Fame. RJ, whose RJ and the Riots band in the 60s was one of the first Pinoy bands to adopt electric instruments and the first Pinoy Rock band to release original rock n’ roll songs and original songs, explains the story behind the concert, "I wanted to do something special for my birthday this year," says RJ, "I'm turning 70 in June and have been very fortunate in my career”. RJ continues, "I have been performing for 55 years, I've had one of the longest lasting music clubs (29 yearsJ in the country, had my radio stations (DZRJ) for more than 50 years and have had the RJ Guitar line of music instruments for over 27 years. I've been very, very fortunate. So for my birthday, aside from the fact that I wanted to celebrate the best way that I know how, by performing, I wanted to give something back" The Pinoy Rock n‘ Roll Hall of Fame is what he would like to gift “I wanted to do something to preserve and recognize all the great Filipino musicians for both the musicians and the generations to come." He will be joined by Pepe Smith, whose Juan de la Cruz Band was perhaps the most notable of the 70s Pinoy Rock era along with such bands as Maria Cafra, Apo I-liking Society, Sampaguita and the like. Ely Buendia's Eraserheads was the most prominent and influential bands to come from the rich 90s era of Pinoy Rock that spawaned many successful bands including Rivermaya, Razorback and Wolfgang. RJ, Pepe and Ely will also be joined by other Pinoy Rock Icons Raimund Marasigan [SandwichJ, Marc Abaya (Kjwan), Rene Garcia [Hotdog), Basti Artadi (Wolfgang), Kevin Roy (Razorback) and Resty Fabunan [Maria Cafra). It could perhaps be the most comprehensive retrospective of Pinoy Rock History, "we want to give people something special to remember,” says RJ. “To launch the Pinoy Rock n’ Roll Hall of Fame, I am thankful to have all these great musicians with me. 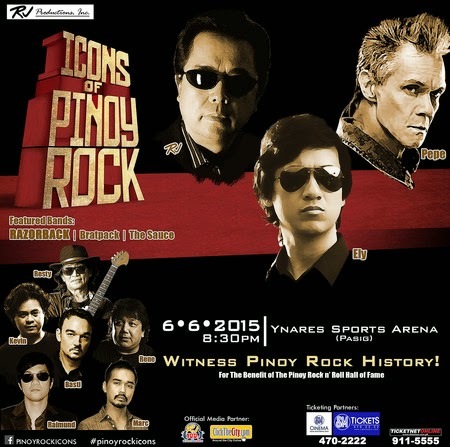 I don't think there's a better way than to celebrate each of their significant contributions to Pinoy Rock history." The Icons of Pinoy Rock Concert is reminiscent of the 70's era when DZRJ had parking lot concerts which were the biggest events in the music scene"in those days. The Rock Jocks became stars and crowds gathered to watch Pinoy Bands, the real music of the masses. DZRJ promoted artists like Sampaguita, Florante, Juan Dela Cruz, and many others by giving them air time and time in the recording studios. In, 1989, RJ, pioneered Pinoy Woodstock, the first 24 hour non-stop concert for peace, love, and, unity, through music in the Amoranto Stadium in Quezon City. It showcased some of the Icons performing in the Ynares Sports Arena, and, other artists like Freddie Aguilar, Rico Puno, Bosyo, The Jerks, Pen Pen, and Randy Santiago. RJ, took this grand concert a step further by bringing Pinoy Woodstock to Cebu the following year. DZRJ also held the historic Supersession Concert to celebrate it's 45*“ Anniversary, in 2008 at the A Venue Events Hall, once again featuring the greatest and latest Pinoy Artists. RJ, is continuing to be true to his mission for the Filipino Artists by launching the Pinoy Rock-n- Roll Hall of Fame and you can be a part of it. For ticket inquiries, please call Ticketnet at (63 2) 911-5555 or SM Tickets at (63 2) 420-2222.